Wild Sister Magazine and ROAR!!! 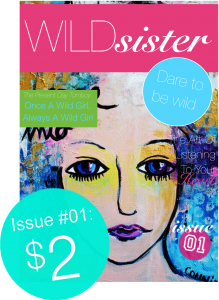 Wild Sister is founded, created and edited by Jen Saunders of My Smiling Heart blog site: http://mysmilingheart.org/. Jen is an amazing woman, who found meaning in her life by deciding to smile, now she makes others smile by inspiring them to follow their dreams. Like writing for a new e-magazine! As per wikipedia, “Life, Liberty, and the Pursuit of Happiness is one of the most famous phrases in the United States Declaration of Independence and considered by some as part of one of the most well crafted, influential sentences in the history of the English language. These three aspects are listed among the “unalienable rights” or sovereign rights of man”. There it is! It is our RIGHT to be Happy. DAMN IT!!! It is $2 for the first issue and $5 for each following….. They have sold over 400 copies in just two weeks!!! Also, there have been so many requests from guest writers to join, that the entire year is already filled and they are now turning people away. So do not get left out, please subscribe!! I know you will be glad you did!